If you are new to Eve, or unaware of politics, or if you live in a space cave, you might not have heard of the CSM. 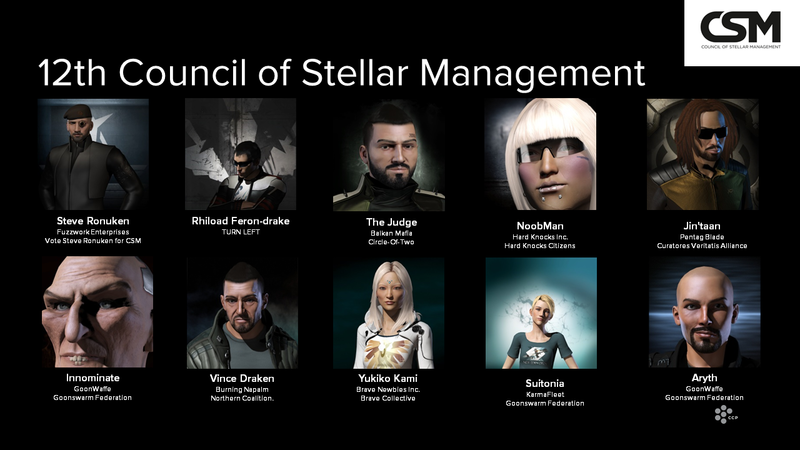 The CSM, or Council of Stellar Managment, is a group of players elected by the rest of us to represent the Eve community for discussions with CCP. 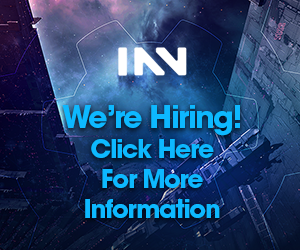 In their recent Dev-Blog, CCP gave us some numbers to crunch concerning the election and more details on the methods used for vote counting. At the top of the iceberg, there is the voting interface. 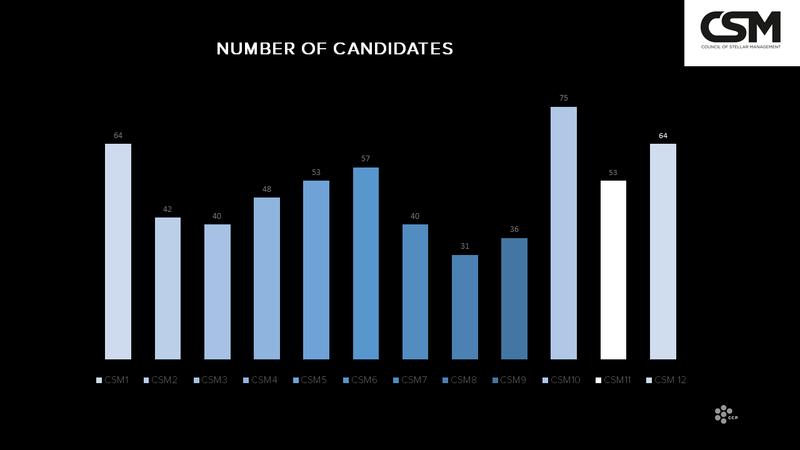 This year, 64 candidates were in the running. This number is quite high, but with a slow start in official candidatures. Of those candidates, each account could select up to 10 candidates: this is his voting ballot. In the majority of the cases, ballots are dictated to a certain extent by the power groups, depending on political agreements. 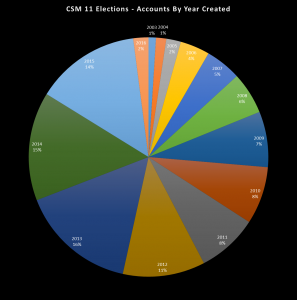 Total member of candidate per CSM election. CSM 12 s the second higher. Each vote (and by vote, we mean voting ballot) is then stored and processed to determine the winner. Before looking at the way it is processed, let’s have a look at who voted: (the demographics. In the dev blog, it is mentioned that 31,274 votes were recorded. 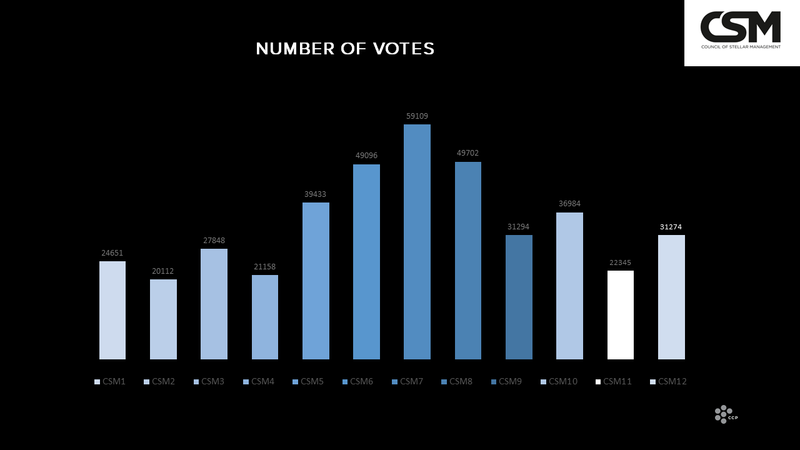 While being higher than the last CSM vote, this remains far from CSM 7 for example, that recorded over 59,100 votes. 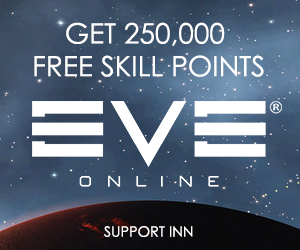 This first stat is interesting as Eve has seen a lot of new accounts last year. We will talk a little bit more about this later on. Of these voters, most were from the United States, followed by the United Kingdom and Germany. Note that Russia only represents a small percentage of the votes (ten times lower than the United States). This might be seen as a reflection of the fact that the big Russian player groups are mostly neutrals and do not interfere with politics. For the rest, numbers are consistent with what can be observed in game in terms of demographics. Last but not least, CCP gave us a chart of voters by account creation year. Starting with older accounts, we can see a consistent rising with a stabilisation around 10% of the total mass for accounts from 2013 to 2015. And then, there is 2016: 16% of the voters. Some of you might think that this is just due to the free to play experience, but remember: only Omega’s can vote. As we said before each account is allowed to vote. This is the main difference with most democratic voting systems, where only one vote can be cast per person. The total number of accounts in Eve has seen a drastic leap during last year. This is mainly due to the new Alpha clones, but not only. The introduction of skill extractors has seen another phenomenon arise: Skill Point farms. The basic idea is to have accounts that are not actively played. Instead, they will be used to generate Skill Points, that will then be extracted. The extracted SP will then be used by another player to boost his own character. Be extracted (skill extractors are not allowed on Alpha’s). These SP farms are often created by older players (mostly traders). This issue of having more than one vote per player is not new, as multiboxing is a known and authorised phenomenon.With the new SP farming mechanics, huge numbers of accounts were created only to train and be extracted. All these accounts had a voting power, as they were Omega’s. 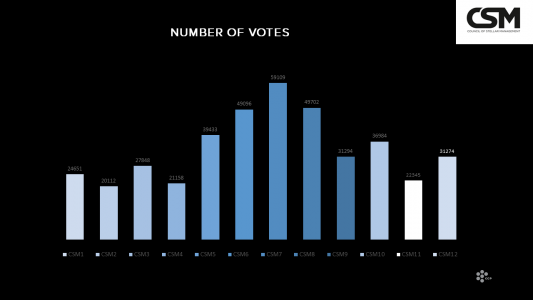 When comparing to last year’s CSM results, we pass from 3,162 voting accounts created in 2015 (CSM 11) to 5,004 (CSM 12) created in 2016. This means that they were 40% more new accounts voting. 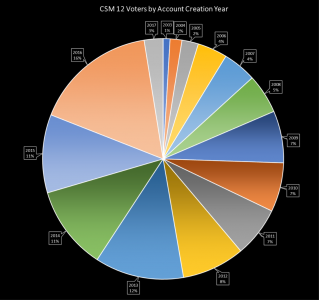 When looking at CSM 11’s pie chart and comparing with CSM 12, we see that before 2016, the voters per year creation start high, go higher when looking to the accounts that are two years old or so, then start declining. This is the reflection of a simple fact: new players do not vote as much as older players. There are many more “young” accounts than older, but since older player are more used to the CSM and involved in space politics, it is a safe assumption to consider a higher proportion votes. This assumption is correlated by the two charts, ignoring 2016. The best explanation for the change in 2016 is the appearance of a lot of new players combined with older players creating new accounts. The Ascension update showed a peak in new accounts, but remember: Ascension was on November 15. Voting took place during the next months, do new players know who to vote for after less than six months of playing? This rise in accounts per old player increases the influence of bigger groups (having more veterans than smaller ones), and especially of older groups, accentuating the Mass Effect. Nope, we are not talking about Mass Effect Andromeda. The Mass Effect is due to one thing: you vote for a list of candidates. By voting for a list of candidates and having multiple candidates from each group, the bigger groups could try to lock down the council to their point of view. When voting for a president, you just want to have the majority: only one electee, so the majority should be “happy”. In our case, you vote for a ballot. This means that you need a way to weight the value of the position of a vote inside a ballot (Is the first place more valuable than the second place?) and between the ballots (Is the first place in a ballot more valuable than ten second places in ten ballots?). They are several ways to handle the problem, each with advantages and disadvantages. CCP opted for the so-called STV system, and for a specific variant called the Wright system. The following section will describe this method. If you are not a fan pure theory, jump to the next one where we will consider various methods and analyze the results. SVT stands for Single Transferable Vote. The idea is that you need to fill several seats, and each voter can give a list of candidates, sorted by preference. Only the first candidate on the list gets the vote. The system will then proceed to elect or eliminate the candidates. When a candidate is elected or eliminated, he is ignored for further reading of the voting lists: if he was first on a list, the second gets the vote and so on. Several ways of redistributing votes and eliminating or electing candidates exist. Reset the loop without excluded candidate. Note that the loop will stop if the number of pre-elected candidates is equal to the number of seats, or if the number of remaining candidates is equal to the number of seats. This means that with 64 candidates and 10 seats, a maximum of 54 loops has to be performed. CCP also gave us access to a zip file containing the python code they used to sort the data, the result file, and the raw data. This last one allows us to see exactly who got what votes and in which order, whereas the result file gives the output of each cycle of the Wright loop. By first looking at the result file, the first thing that appears is that Aryth got elected directly with 4,981 votes (the quota being 2,844). This is not really a surprise, as being on top of one (or several) ballots promoted by the bigger groups almost guarantees to be elected. What is interesting to note that the next electee is Innominate (680 “initial votes”) at round 32. This might look strange as Innominate was far from the top ten candidates in terms of first votes but do not forget that when a candidate is elected or eliminated, his votes are transferred to the next candidate of each vote. When looking at the data, we can see that Innominate gets over 90% of the surplus votes from Aryth. Being second on a ballot is only worthwhile when the candidate before you is elected or eliminated. In this particular example, being second was very good, but was it always the case? When looking at the scores of Steve Ronuken, we see that he has a very good “initial votes” number (he is second, just short 2200 votes). He also has a good second place ranking landing behind Innominate with 1600 votes. He was however only elected at round 44, 12 rounds after Innominate. Where we can see that 2 of the actual electees would not have made it to the 10 first, and 2 (bolded for you) would have made it for the 14 seats in both cases. An extreme is the case of Sullen Decimus: he is in the top 5 with this last voting system but did not get elected. The result is pretty much identical to the linear weighting, which is not so much of a surprise as most of the bigger groups use diplomacy to place their candidates on friendly-ish ballots in exchange for the promise to put the friendly-ish candidates on theirs as well. Note that Dankul1001 and Capri Sun KraftFoods would have both been elected using classical weighting. Those were secondary candidates from Pandemic Legion and Hard Knocks Citizens, both had thus a good visibility by being on several ballots, but almost never as first or even second choice. What it is important to notice at this point is that STV allows you to vote for someone else only if you already elected someone (or if your favorite was eliminated). It also means that being third on a ballot, you will need to have the two candidates before you to be eliminated or elected to actually have any vote that counts. And the further you are on the ballot the worse it is! If we look, for example, at the cases of Sullen Decimus or Dancul1001, this effect is very clear. They both have raw numbers that are good, but they have more low-tier votes than high-tier ones. Even if they had more global votes, which means they reached out to more people, they would not have any advantage. The STV system was meant to give a proportional representation, which means that bigger groups get more representatives than smaller ones, but smaller still get representatives. The problem is that reducing the number of seats, as it makes the threshold higher and redistributes fewer votes, will directly profit to representatives that are high ranked on big group ballots. This is a well know issue, encountered in real life elections. The system still works against group willing to put their pure number power in the balance to tilt it directly to them, but it will also neglect candidates that would meet the different parties halfway down. The fewer the seats, the more extreme the type of candidates. The Mass Effect described earlier has moved from making it possible for one big group to overwhelm the voting to the top candidates of the first five groups or so to have guaranteed seats, giving fewer chances to candidates that would gather secondary votes from opposite groups. The threshold effect imposed by fewer seats is even more impressive when looking at the effect of a 12 seat CSM: the result would see Yukiko Kami eliminated instead of being elected; and Kalbuir Skirate, Sort Dragon and Sullen Decimus would have been in. A change of two seats would effectively eliminate a candidate that was elected in this case. The STV system has shown its forces and weaknesses during these CSM elections. While it worked pretty well in stopping an enormous group to tilt the balance entirely towards them using numbers, it also removed a lot of the advantage provided by diplomacy and compromise. One of the issues often seen during STV elections is that candidates need to focus on being number one, and will often target a group of people to ensure they survive the first rounds of elimination with high initial votes. Surviving these first rounds does not guarantee a seat, and the next part is more about who you are following. Candidates that manage to place themselves in ballots with candidates that were not eliminated nor elected early are at disadvantage. The complexity of the Eve political landscape is that there are no really defined political entities (for the CSM, not talking about space control). Various power groups are operating together and against each other to try to be able to put their concerns on CCP’s table. The strength of STV is to give a point to everyone, and in that the idea of CCP to use it is understandable. 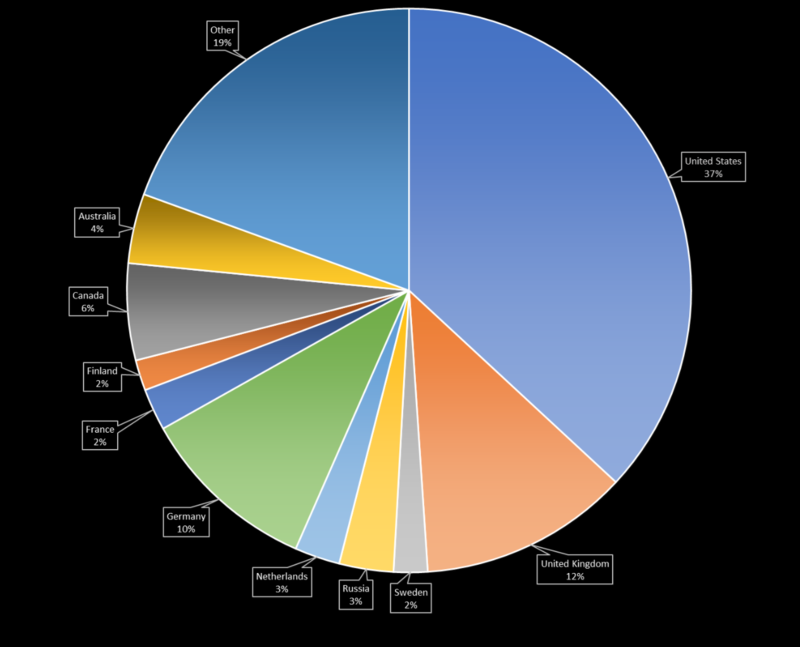 On the other hand, some candidates had views that were reflecting a broader part of the Eve player base and could meet the different parts halfway. As the role of the CSM is not to rule but to transfer the view of the players to CCP, would it not be more meaningful to have voices that everyone could listen to rather than voices some would want to shut down? Thanks Mischa. It was interesting seeing the final few rounds, where Kalbuir being eliminated bumped Yuki over the threshold and into the CSM. Very well put together article. This was my first encounter with an explanation of the STV system. Thank you for your work to make it clear.